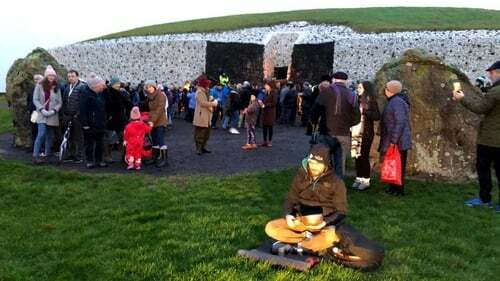 Crowds gathered at Newgrange in Co Meath this morning for the Winter Solstice - the astronomical phenomenon that marks the shortest day and the longest night of the year. However a damp and cloudy start meant it remained in darkness today. In the Northern Hemisphere, the winter solstice occurs on either 21 or 22 December, when the sun shines directly over the tropic of Capricorn. Sunrise on the shortest days of the year begins at 8.56am and the light shines into the Newgrange chamber for 17 minutes. The Office of Public Works opens the monument for the dawn from 18 December to 23 December. By Sunday, 60 people - including visitors from as far afield as Australia, Brazil and Canada - will have had access to the chamber.